It won’t replace your beloved Rasbperry Pi, but it’s worth saying hello to this “Strawberry Jam”, straight out of Japan. It’s an equally delicious way to get people interested in the basics of coding. My hackerspace friend Jim is a lucky bloke, for last year he was able to take an extended holiday through a succession of East Asian countries. We were treated to online pictures of beautiful scenery and beaches, city lights, and of course exciting tech destinations such as hardware markets and hackerspaces. On his return he tossed a package on the table in front of me and said “Jenny, you might like to take a look at that, these are big in Japan!” Inside was an electronic kit and a few pieces of documentation, with Japanese text. 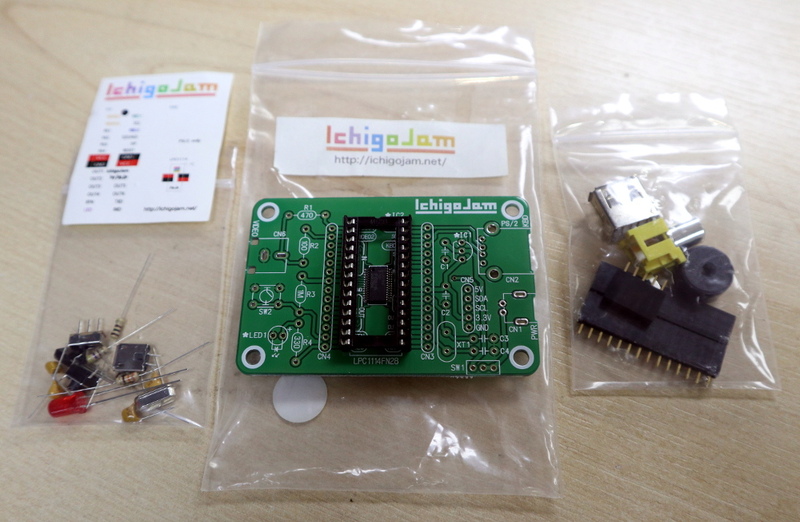 The contents of the IchigoJam kit. What he’d given me was an IchigoJam (Best translation I’ve been given is “Strawberry Jam”), a small single-board computer aimed at young people. In the style of the 8-bit machines of the 1980s, it runs a comprehensive BASIC interpreter and plugs into a TV set, though it brings itself up-to-date with a USB-A socket for a keyboard. At its heart is an NXP LPC1114F102 ARM Cortex-M0 microcontroller with 32KB of Flash and 4KB of SRAM, and though the board Jim passed to me has a surface-mount example it’s clear that it was also designed for the now-obsolete DIP variant of the chip. If you were to think of this as an odd hybrid of a BASIC Stamp, a Raspberry Pi, and one of the smaller MBED boards, you probably wouldn’t be too far from the mark. What follows is my impression of it based on the information at hand. Sadly the IchigoJam website and forum seems only available to Japanese viewers and returns an error code from my European perspective. In Japan, tea ceremony (cha-dou) is revered as a way to a gain deeper insights into life and philosophy. Traditional Japanese tea ceremony practitioners put in long hours to master the intricacies and details of pouring tea. The road to becoming a tea master is crucial as it develops the practitioner’s mental state as well as physical technique. However if you don’t have time to master the “way of tea”, then you can build a bot and automate your zen experience. That’s exactly what the people at Ano Labs did when they built their Japanese Tea Ceremony Robot #151A. Quick iconoscope primer. It was the first video camera tube, invented in the mid-20s, and used from the mid-30s to mid-40s. It worked by charging up a plate with an array of photo-sensitive capacitors, taking an exposure by allowing the capacitors to discharge according to the light hitting them, and then reading out the values with another electron scanning beam. The video chronicles [Ozaki Yoshio]’s epic rebuild in what looks like the most amazingly well-equipped basement lab we’ve ever seen. As mentioned above, it’s quirky: the iconoscope tube itself is doing the narrating, and “my father” is [Ozaki-san], and “my brother” is another tube — that [Ozaki] found wrapped up in paper in a hibachi grill! But you don’t even have to speak Japanese to enjoy the frame build and calibration of what is probably the only working iconoscope camera in existence. You’re literally watching an old master at work, and it shows. A Japanese lab is investing some time in the possibilities of a 5-axis 3D printer. They show it printing using five axis as well as doing finish machining on a printed part. We’ve covered parts of why this is the right direction to go for 3D printing in another post. It looks like they have modified an existing industrial machining center for use with a 3D printing nozzle. This feels like cheating, but it’s the right way to go if you want to start playing with the code early. The machines are intensely accurate and precise. After all, building a five axis machine is a well known science, 3D printing with one opens a whole new field of research. There isn’t too much to show in the video, other than it’s possible and people are doing it. The Five-axis 3D printing and machining is uninteresting, we have been able to machine plastic for a long time. However, they show one blue part in which the central axis of the part was printed vertically, but revolute splines along its outer perimeter were printed normal to the surface of the already printed 3D part. Which is certainly not commonly done. Video after the break. W e’ve featured a lot of clock builds, but this one, as the title suggests, is frickin’ amazing. Talented art student [Kango Suzuki] built this Wooden Mechanical Clock (Google translation from Japanese) as a project while on his way to major in product design. There’s a better translation at this link. And be sure to check out the video of it in motion below the break. [Kango]’s design brief was to do something that is “easy for humans to do, but difficult for machines”. Writing longhand fits the bill, although building the machine wasn’t easy for a human either — he needed six months just to plan the project. The clock writes time in hours and minutes on a magnetic board. After each minute, the escapement mechanism sets in motion almost 400 wooden cogs, gears and cams. The board is tilted first to erase the old numbers, and then the new numbers are written using four stylii. The clock doesn’t have any micro controllers, Arduinos, servos or any other electronics. The whole mechanism is powered via gravity using a set of four weights. [Kango] says his biggest challenge was getting the mechanism to write the numbers simultaneously. While he managed the geometry right, the cumulative distortion and flex in the hundreds of wooden parts caused the numbers to be distorted until he tuned around the error. Akihabara, Tokyo has transformed over the years. In its present form Akihabara emerged from the ruins of a devastated Tokyo after World War 2 when the entire district was burnt to the ground. The area was rebuilt in the shadow of the Akiba Jinja (dedicated to the god of fire prevention), and a new breed of street vendors began to appear. Huddling under the protection of railway bridges, and dealing mostly in Black market radio parts, these vendors set a new tone to what would become Japan’s “Electric Town”. And as Japanese manufacturing prowess grew so too did Akihabara. Now of course Akihabara is also home to Otaku culture, and is perhaps best known in this regard for its maid cafes. Streets are littered with maids touting their cafes, somewhat incongruously among computer outlets and precision tooling stores. My interests however lie squarely in Akihabara’s glorious junk bins. Of all places I think I’m happiest digging through this mass of discarded technology from Japan’s manufacturing past. A tour through the junks bins is like an archaeological dig. And in this article I will present some recent finds, and ponder on their relevance to Japanese manufacturing. It’s basically an advert for a Autodesk, but the video is so ridiculous, we can’t resist: The MegaBots team challenges Suidobashi Heavy Industries to a robot battle.